Power-Ups allow you to turn your Trello boards into living applications. By enabling the Figma Power-Up, you can add live embeds of your Figma files and prototypes as a way to communicate more effectively with designers, developers, and other stakeholders on your team. 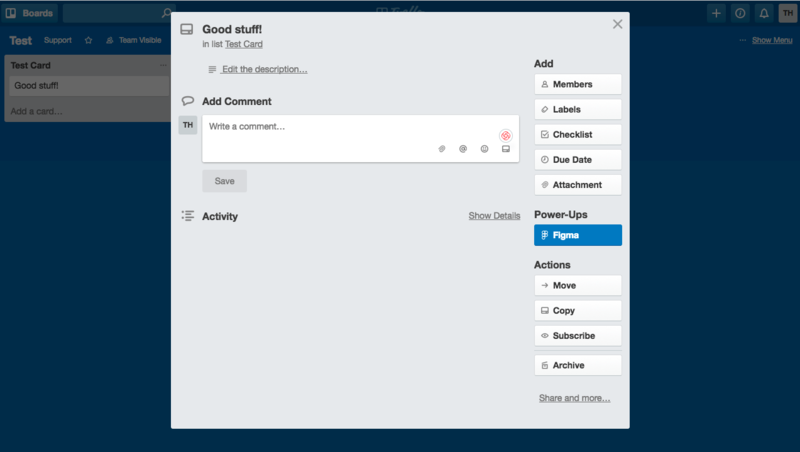 Now, when members of your Trello team open any new or existing card, on any board in the team, they will see Figma listed under Power-Ups in the card view. You can add more than one Figma embed to a card. To view them all, click Show all Figma attachments. You can also add Figma file links in the description and as comments. If you're using a mouse or your laptop trackpad, you can click and drag to move around the live embed. You can pinch to zoom on your trackpad, and if you are using Apple's Magic Mouse, you can hold Command while dragging your index finger forwards and backwards on the mouse. If others are updating the file, you will see those changes reflected in real-time. Click Remove at the upper right corner of the attached Figma file and confirm that you want to remove the attachment. If you have more than one Figma file or prototype attached to a card, you will have an option to select which one to remove. Read more about our integration with Trello on our blog.